It's all about the water! 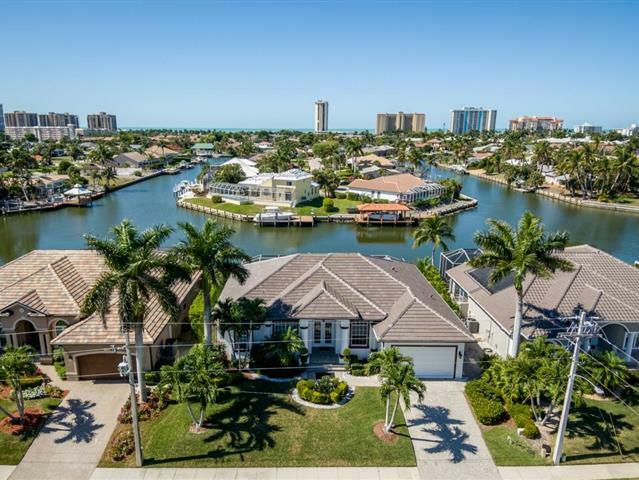 Enjoy wide and long water views with southwest exposure while you relax on your lanai. Watch the gorgeous evening sunsets skies as the last glimmer of rays dance across the water and the city lights of Marco appear in the distance. This open floor plan waterfront home has 14 ft ceilings and features tray ceilings in the living area, master, and 2nd guest bedroom. Home boasts 3 bedrooms plus den, 3 full bath, (one serves as a pool bath), formal dining area, kitchen with granite counters, breakfast nook, tile on the diagonal, and a 2 car garage. Sliding glass doors open to the brick paver lanai with pool and spa, boat dock and lift.